John Wallace only leaves his home to buy groceries or pick up his medications. The once outgoing Vietnam-era Marine veteran now passes most of his days alone, watching TV in his South Boston apartment. His partner of 15 years passed away a decade ago. “I don’t want anybody to see me,” says the 64-year-old. What John doesn’t want people to see is how badly he has been disfigured by lipodystrophy, a metabolic complication of his HIV medications that creates abnormal fat distribution in his body. Lipodystrophy has caused an excessive accumulation of fat on John’s upper back (commonly known as a “buffalo hump”), which he tries to conceal by wearing his hair long. It causes headaches and prevents him from turning his head. 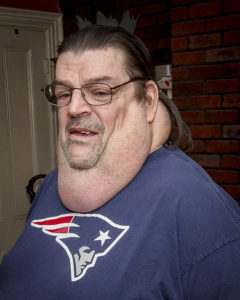 His neck is engulfed by fat, making his head appear abnormally large. The disproportionate accumulation of fat in his torso makes his body lopsided, which throws off John’s balance and restricts his ability to do even basic housecleaning chores. Last year, in the hope of alleviating his lipodystrophy John stopped taking his HIV medications. After about a week he became so ill that his sister caught on and persuaded him to resume his medication regimen. Despite the physical and psychological harm John has suffered since his lipodystrophy developed around 2003, he has had difficulty accessing treatment. The majority of health insurers, including John’s, refuse to cover treatment, claiming it is cosmetic and therefore not medically necessary. MassHealth denied John’s request for prior authorization for his lipodystrophy treatment. He considered appealing the decision but did not follow through because the process felt too daunting. John has not reapplied for treatment since then, believing that he’ll just be disappointed again. Occasionally John forgets about how he looks, until he glimpses himself in a mirror or notices a child staring. “It’s horrible,” he says of such reminders. A year ago John broke down at the Registry of Motor Vehicles after being photographed for a new driver’s license. “I looked at the picture and I started crying right there in the middle of the Registry,” he recalls.